Trends in clothing such as those seen above from the early 1800s, forced a distinction between the wealthy class dressed in European styles, and the lower classes whose simple homespun materials made for more durable, if less attractive, garments. Who would wear the pants in most American families — men or women? The social change dictated by the Second Great Awakening, to some degree, tailored the answer to that question. 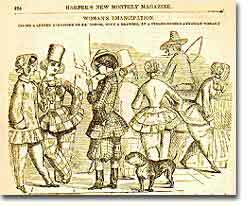 A 19th century cartoon satirizing white women who dressed and acted like men in an attempt to further the cause of women's rights. Gender implications intertwined with these religious and economic changes. The republican emphasis on equality and independence as fundamental principles of the United States challenged traditional concepts of family life where the male patriarch ruled commandingly over his wife and children. In place of this dominating father-centered standard, a new notion of more cooperative family life began to spread where husband and wife worked as partners in raising a family through love and kindness rather than sheer discipline. A transition of this magnitude occurred over a long period of time and with an uneven impact throughout the country. Middle-class women in the northeast, however, were at the forefront of this new understanding of family life and women's roles. As with the economic expansion of the Industrial Revolution and the reforms of the Benevolent Empire, the northeast was at the leading edge of major social changes in the new nation. 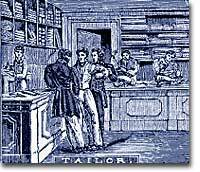 This engraving from 1836 depicts the inside of a tailor shop. When an order was made, bolts of fabric were delivered to seamstresses who would cut the fabric at their homes — for a fee 25-50% less than their male journeyman tailor counterparts. Assessing the benefits and limitations of these changes for white women has been the source of a great deal of disagreement among historians in recent years, but it is clear that the new developments of the early-19th century helped to establish gender patterns that have remained strong up to the present day. For example, it was only in the 1820s and 1830s that women began to displace men as the overwhelming majority of schoolteachers. This development brought clear advantages to women who increasingly received advanced education to become teachers. Furthermore, teaching brought high moral status and an acknowledged public role in improving American society. On the other hand, the rise of female school teaching also suggests the limited choices available even to middle-class women. They had almost no other options for public employment and were chiefly attractive to employers because they could be paid less than men. Ultimately, we need to recognize how the rapid changes of this period included both positive and negative qualities. White women came to possess a new social power as moral reformers and were thought to possess more Christian virtue than men, but this idealization simultaneously limited white middle-class women to a restricted domestic sphere. Furthermore, this new standard of womanhood could be achieved neither by working-class women nor by enslaved African Americans. The Massachusetts Foundation for the Humanities presents this site on Dorothea Dix. Dix started out as a schoolteacher like many women of her time, but found her calling as an advocate for the mentally ill. Hers was a revolutionary idea — that the mentally ill should be treated humanely. This huge and well-organized site is dedicated to great and notable American women. There are currently biographies and pictures of over 160 women, and you can participate in the Hall of Fame by nominating someone you feel deserves recognition. Many women from the early U.S. are honored here, along with Nobel prize winners, civil rights activists and astronauts. Elizabeth Seton founded the first Catholic school in the United States (which led to the parochial school system), and was the first American-born Roman Catholic saint. In this eloquent denunciation of slavery, Angelina E. Grimké illustrates how slavery of her time differed from that condoned by the Bible. She brings up the humane treatment of biblical slaves, and the relative ease with which they regain their freedom. Grimké's passion speaks out over 100 years after her death. The most striking trait in the women of America is their superiority to the men of the same country. -Gustave de Beaumont, On the Different Roles of Men and Women in Marriage,1831. NASA named a Mars probe after African-American traveling preacher Sojourner Truth, who was an evangelical Protestant during the Second Great Awakening.